Visitors often style Ghent, Belgium as an under-the-radar alternative to Bruges: chock full of medieval architecture easily on par with the more famous Bruges, instead the city has a peaceful, small-town atmosphere despite its quarter-million inhabitants, not to mention curiously few tourists. As a university town, Ghent also has a lively atmosphere courtesy of the local student population, which breathes new life into its medieval edifices. And, at just over 200 miles (125km) from Amsterdam, it's easily reached from the Dutch capital by train, bus, and car. While there is no direct train connection between Amsterdam and Antwerp, the trip takes just two hours, 25 minutes on the Thalys train, with one transfer in Antwerp. Fares from Amsterdam Central Station to Gent-Sint-Pieters, the city's main railway station, start at €35.40 ($50) each way. Travelers can also take the "Intercity direct" train from Amsterdam to Rotterdam, then an Intercity from Rotterdam to Antwerp and another from Antwerp to Ghent; the trip duration is about three hours, 18 minutes, and fares start at €38 ($50) each way. Tickets for both routes can be booked at the NS Hispeed website. As to be expected, international coach to Ghent is the slowest but most economical option for travelers. Two international coach companies travel between Amsterdam and Ghent; fares start from €9 ($12.40) each way on Eurolines, €15 ($20.60) on Megabus. Don't be too tempted to save those €6 with Eurolines, however - while the Megabus route takes just three hours and 40 minutes, Eurolines takes an astronomically slow six hours and 15 minutes to reach Ghent. Book early to lock in the cheapest fares. Each bus company has its own departure and arrival points: The Megabus Amsterdam stop is located at the Zeeburg bus depot on Zuiderzeeweg in Amsterdam (served by tram 26 and buses 37 and 245), while the Ghent stop is situated at the Hotel Campanile, Akkerhage 1, which is about a half-hour bus ride (line 65 or 67) from the city's main station, Station Gent-Sint-Pieters, and the southern boundary of the city center. The Eurolines stops are located outside of Amsterdam Amstel Station, about 10 minutes by train from Amsterdam Central Station, and Station Gent-Dampoort, just east of the city center and a half-hour commute from Station Gent-Sint-Pieters. Travel to Ghent by car can be just as fast - if not faster - than the train, and quite convenient if you plan to visit various nearby cities. The 137-mile (220km) drive takes about 2.5 hours or less without traffic. Choose your preferred route, find detailed directions and calculate trip costs at ViaMichelin. 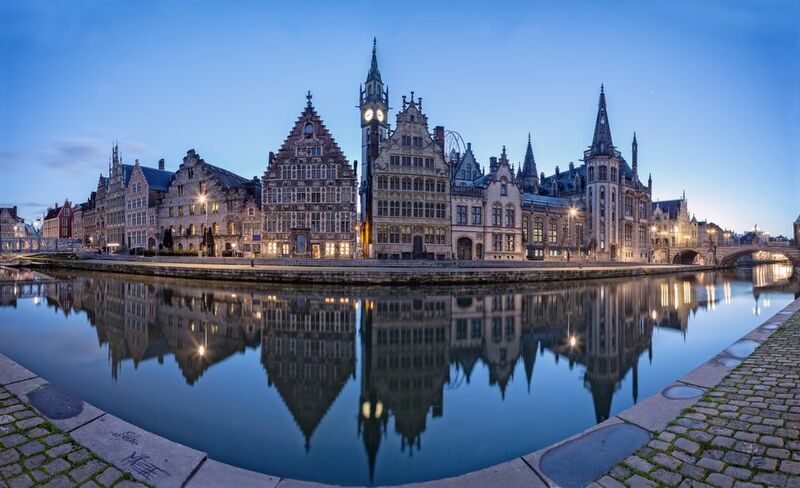 Europe Travel offers a fine introduction to Ghent and its main attractions, such as its iconic Belfort and Lakenhalle (Belfry and Cloth Hall) in its Ghent Travel Resources. Consider a Brussels - Ghent - Bruges itinerary to discover these three nearby cities that comprise some of the country's finest travel destinations.